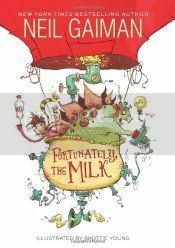 Neil Gaiman's latest, Fortunately, the Milk, is a goofy little tale of a father, a bottle of milk, some pirates, aliens, dinosaurs, vampires, and volcano gods, all steeped together in the space-time continuum. One morning, a brother and sister find themselves with no milk for their breakfast cereal, and their father, when realizing this means he also has no milk for his tea, decides to stop to the corner store for a bottle. When the father finally returns after making the children wait and wait, the story he has to tell of his adventures in keeping the bottle of milk safe for them is quite sensational, starting off with being abducted by aliens. What follows from there is an imaginative romp through space and time that is nothing but fun. There's nothing challenging here, and the story certainly doesn't take itself seriously. Skottie Young's stylized sketches throughout really highlight the story and add to the goofiness. He has a style that's uniquely all his own, and that style meshes with this story perfectly. This would be a great book for a dad to read with his kids, but adults without children (like me) can enjoy it just as much. Recommended!